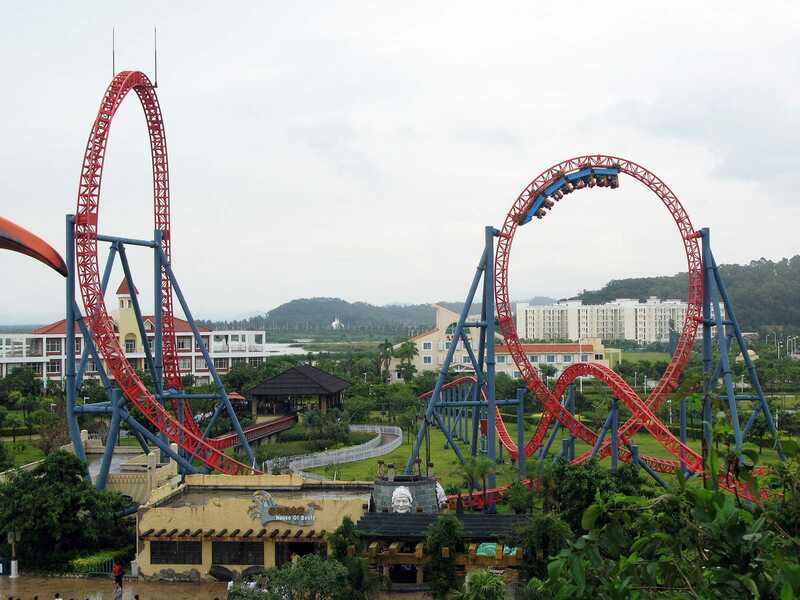 Mysterious Island is a mid sized park located in the larger Ocean Spring resort in Zhuhai, China. 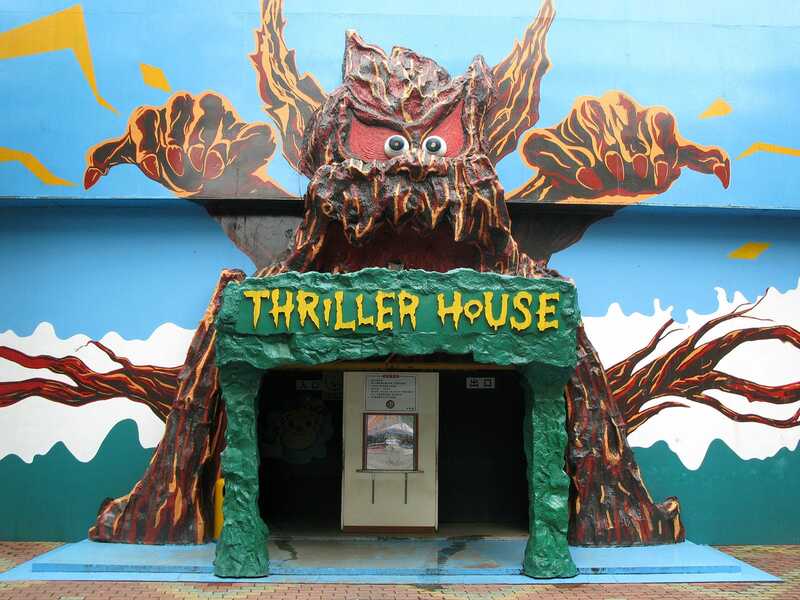 It was oddly reminiscent of Lagunasia, albeit with only one high quality dark ride, in this case the Haunted Ride. Though largely a motion dark ride the cars stopped from time to time for projection effects to run; there were also regular blasts of compressed air timed to make riders jump. Skycar (#1283) is the larger of the two coasters in the place. It isn't quite the shortest hydraulically launched coaster from Intamin, but it's close; it features a launch, a top hat, a vertical loop, a helix, and a brake run; the total time from launch to brakes is no more than twenty seconds. Those twenty seconds are intense and thrilling, but they are over too soon to leave a lasting impression. We were fortunate to have a session on this ride early in the morning, allowing us to get several laps in before park opening, as it would not have been worth waiting any length of time for except as an alternative to the other coaster. That ride is a screaming squirrel design christened Man O War (#1284), and like its brother it ranks on the far side of horrible. Once was more than enough. It is impossible for me to begin my trip report for Pearl Land without discussing briefly the ride which is most definitely not a coaster. The Cycle Monorail features a chain lift followed by a very slight slope for its remaining track. As such it is actually possible to coast all the way from the crest back to the station. However, achieving this feat requires a decent burst of speed at the top that can only be obtained by pedalling. Additionally, one has to have a balanced weight between both sides of the car and no other cars blocking the track in front. I rode twice in order to make my mind up properly, and while the first ride coasted all the way the second stalled three times. In short, it is not a coaster despite what David might think. The Loop Screw (#1285) required quite a bit of effort for most of our group to ride, and even then some people were just too big. The problem was the over the shoulder restraints, which had slightly different clearances in each seat. As such, those with bigger shoulders needed to sit in certain seats, and there was no immediate way to determine where these should be other than with trial and error. This might have been forgivable if the coaster was worth the effort, but to be frank, it wasn't. The Jungle Mouse (#1286) was one of the better mice of the trip to date, being wild without having bone crushing impacts in the corners. The Children's Coaster (#1287) was also one of the best of the trip, having a neat custom layout which provided both speed and airtime. The real star coaster of the park however was Jet Coaster (#1288), which brought us on a moderately interesting tour of a large area of the park using steep enough hills to be interesting. With the coasters cleared, I made my way through three walkthroughs; the Dark Journey, the Thriller House, and the Mirror House. All were mediocre at best, albeit a decent way to escape the heat at least for a few minutes. Taller people should be aware that the mirror house is designed for the Chinese, necessitating a considerable amount of head carefulness. Amazing World was a planned stop on yesterday's itinerary, but due to poor weather conditions all the rides were closed. The reason for the visit was Roller Coaster (#1289), an oversized roller skater very much in the mould of Boomerang at Toverland. The ride was surprisingly good, and a definite candidate for one of the top five steel coasters of the trip. There were also two bonus credits; the Flying Coaster (#1290) and the Happy Trip (#1291). Both were rides that stretch the definition of a coaster, but they were largely powered by momentum other than for the tire drives at the base of each hill. We also tried the Devil's Joy Ride walkthrough which was filled with live actors. One of them tried to prevent Keith from leaving at the end, though he eventually escaped!